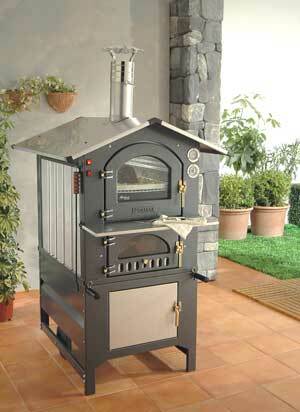 The GUSTO, Fontana's best selling unit, is the original portable wood-fired oven. The Fontana GUSTO oven, which performs equally as well as the traditional brick oven, can be used for 'brick oven' pizza, bread, roasts, chicken, or vegetables. Many of these beautifully constructed ovens can be found in Italy to still be in use after 30 years of service. The Fontana GUSTO is a heavy duty unit that is made of a combination of cast iron, steel, and stainless steel for years of dependable use. They are extremely practical and easy to use - equipped with an interior light and a convection fan. These wood fired ovens are extremely efficient, heating up in 45 minutes and maintaining their heat for 1 1/2 hours while consuming 5 times less wood than a traditional brick oven. The inside of the cooking chamber, with three large shelves, has additional side walls in refractory steel for even greater heat retention and more uniform heat diffusion. For a more complete cleaning, the walls can be completely removed. GUSTO 80AV - Depth 32", Width 16", Height 16"
GUSTO 80AV - Depth 48", Width 40", Height 63"